Well I’ve been back at work in the studio now for a couple weeks and having great fun playing around with teacups and pencils and rocks, brushes and barbie dolls. But I’ve been woefully remiss in writing blog entries…mostly because I returned from the Vineyard show renewed and ready to hit the easel and have beenmuch happier sitting in that chair than at this computer. So there ya go. But the other night, when I finally put down the brushes and left the studio to walk over to the log cabin…it was DARK ! Where did that summer go ? I was nestled in the air conditioned studio when the heat wave broke so I’ve not been paying attention to the world outside and the whispers of a new season approaching caught me off guard. I’m on it now though. Finnegan and I can walk a little further in the early morning as the temps cool down. Pat and I can sit out in the studio yard at night and not be chewed to bits by bugs. I actually opened a window the other day. Can that be the sound of Zola’s school bus I hear in the distance ? Anyway, life goes on and quite merrily here by the Little Conewago Creek, and I hope the last days of summer are full of fun for you all. What brought me to the computer chair today is to let you all know that another Granary Gallery show is happening this weekend. A theme show that artists from all three of their island galleries were invited to participate in. The theme this year…ACTUAL SIZE. 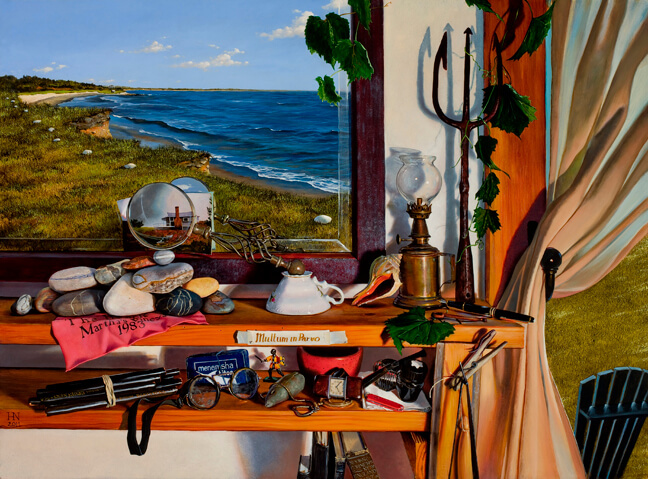 It’s actually the shelf right behind my easel chair…with a bit of artistic license…or simply just wishful thinking… in the mirror. Anyway, as my friend Ted says… it was sorta fun. Back to work for me… stay frosty out there !